NYC percussion legend Bashiri Johnson and Industrial Strength Samples team up to deliver a monster pack replete with hits and live percussion—all of it straight from the veteran groove maven's personal collection of rare instrumentation. The stunningly comprehensive Bitz & Piecez Vol.1 is testament to the Bash-man's versatility and uncut originality. Culled from his decades-in-the-making personal collection of world instruments, it's a head-spinning wealth of One shots, jungle-primed loops, and the authentic stems. This pack features over 1Gb of Bashiri goodness at your disposal, there are grooves for any style you see fit. A studio guru as well as a fabled live performer, Johnson is one of the most prolific and sought-after percussionists this side of the galaxy.Revered by producers and stars for his soulfulness and intuition, Bashiri is a world class musician and he has performed and recorded with the likes of Beyonce, Jay-Z, Michael Jackson, Whitney Houston, Miles Davis and the Rolling Stones. Precise and powerful, Bitz & Piecez Vol.1 was recorded by NYC's famed Roc Isaacs, who put to tape such names as Run DMC, Mary J. Blige, and Ziggy Marley. Isaacs rendered the cream of Bashiri's collection in glistening 24-bit, 44.1-kHz samples, while Industrial Strength's Lenny Dee remixed all the stereo loops for you to dig into. This pack is formatted in Apple Loops and Rex.2 for total versatility. The incredible amount of one shots in this first collection are ready for use within NI Battery 4, NI Maschine, and Logic Exs. Each loop is set up as clearly labeled kit which contains all the original recorded stems and remixed variations. For an exhaustive catalog of organic percussion shots and home-grown grooves, Look no further than Bitz & Piecez; a collection of true keepers for the purists in all of us. 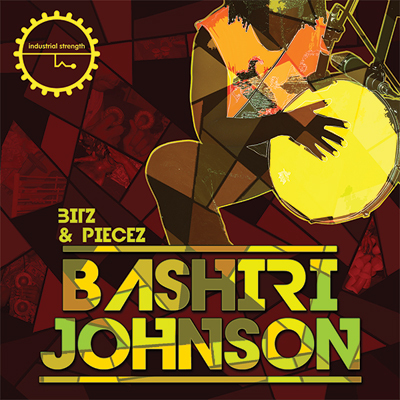 "Bashiri Johnson Bitz & Peicez by Industrial Strength Records gives you the power of real live percussions. If you’re looking to take your electronic drum game to the next level, this is the sound pack for you ! Ismell GRAMMY'S with this one .... LET’S GO PEOPLE!!!! "